You are here: Home / Blog Post / How many clerks spoil the benefit auction broth? 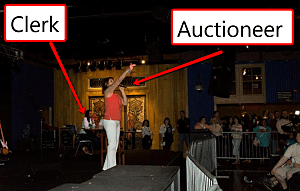 At a benefit auction, you need someone to record the sale prices. That person is typically called a clerk, secretary, or recorder. 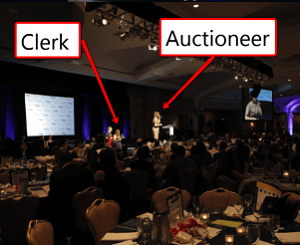 Although an auctioneer could clerk his own benefit auction, it slows the sales process and isn’t a best practice. The auction clerk stands or sits near the auctioneer at the front of the stage. Oftentimes the clerk sits right next to me, while I stand at the podium. This is not a stressful job, but many nonprofits seem to think it is. I think it’s because they’ve put the wrong person in the role of clerk. The clerk is someone who has good hearing and can focus. She’s not drunk, and ideally, hasn’t been drinking. She should be an accountant or finance-type … someone who recognizes the importance of recording a number correctly. She’s comfortable sitting on stage with the auctioneer, and just as comfortable interrupting the auctioneer (when needed) to confirm a sale price. She listens to the auctioneer, and doesn’t really pay attention to the audience. That’s it. It’s not that difficult. The clerk has all the power. The auction can’t (or shouldn’t) move forward until the clerk has recorded the winning bid number and the sale price. In fact, at some auctions when the clerk is obviously nervous, I’ll verbally confirm with her after each sale. “Did you get that, Debbie? Are you ready?” I might say. Sometimes a nonprofit believes that having two or three clerks is a better idea. “We’ll station them around the room. If Shelly misses it, Robin can get it,” they tell me. In theory, the plan sounds good. In practice, it fails. What more often happens is that Shelly misses the number but doesn’t want to interrupt the auctioneer. “Robin probably got it,” she hopes. And Robin, who didn’t hear it either, hopes Shelly wrote it down. Later they both realize neither has a number. They ask the auctioneer, who has no clue what they are talking about. When you assign a one-person job to two people, you’re merely giving them a cop out. It’s a case of too many cooks in the kitchen spoiling the broth. If only Shelly (or only Robin) was the clerk, she would take her job seriously, realizing that she alone was responsible for accuracy. She ‘owns’ her job. If needed, she has no hesitation stopping the auctioneer to confirm a number because she knows no one else can save her. Clerking is a straightforward volunteer role. When you divide it among two or more people, you’re increasing the odds of an error. When I’ve seen clerks get flustered, it’s inevitably due to a poor practice. The group has multiple clerks … they station them at the back of the room … and they tend to be people who would rather “be social” than work. We’ll cover how to make your first few auctions EASY. You’ll learn the best practices to start in Year #1 of your auction, which then enables you to lay the foundation for strong growth in the following years. Dean, I’m Ashley and posting here, just so you know. Sherry is in Kansas for a couple of weeks to be with family.